Circle hooks are used for commercial long-lining. They are also called G hooks or tuna circle hooks. Tuna circle hooks are mostly used for catching fish other than pelagic species such as snapper. The advantage of a circle hook is that it rotates when a fish bites on it causing it to self-set in the mouth of the fish. Hooked fish are almost always caught in the corner of the mouth as they attempt to swim away with the bait. It is essential for the line to exit the hook eye on the point side for proper self-setting. Incredibly I have found made-up deep sea rigs being sold in several tackle stores where the hooks have been tied on backwards incorrectly! Circle hook sizes range from 8/0 all the way up to an enormous 20/0. Sizes 18/0 and 20/0 are used when long-lining for big tuna and swordfish. In the western hook measurement system, the length of a hook is measured from the point to the eye. If this distance measures 8cm for example than the hook is an 8/0. 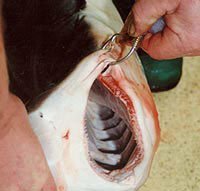 Typically fish are caught in the corner of the mouth with tuna circle hooks, as with this shark, making it a simple job to release unwanted fish back into the sea unharmed. 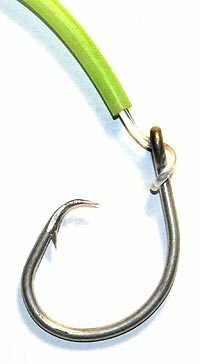 The self-setting nature of circle hooks makes them ideal for recreational anglers fishing in deep water for bottom fish like groper. In water over 100m deep, it is impossible to feel the bite of a fish when fishing monofilament lines on rod and reel. Indeed I have fished off Dunedin where strong currents off Taiaroa Head have caused me to lose touch with my puka bomb in less than 50m when fishing monofilament. Low stretch braided super lines have helped a great deal to increase touch at greater depths. However, tuna circle hooks, or E-Z baiter hooks, are still the best option when fishing at depths over 100m. Take careful note of the correct side of the hook the monofilament exits the eye shown correctly in the picture. This is essential for proper self-setting.